Review: It’s 2059. France and Britain have merged and are doing quite well, aside from the fact that King William is in hospital following injury in an explosion, Victoria Valois has bene called back to London following the brutal murder of her husband, and soon finds herself caught up in a conspiracy theroy involving a flight to Mars. Merovech, heir to the British throne, is on the run after breaking into a research lab with his girlfriend, Julie. And there is a soldier called Ack-Ack Macaque, whose job it is to fly spitfires and take down German bombers. He’s also an eye-patch-wearing, cigar-smoking, monkey. All kinds of fun!The premise of a non-humanoid (kind of...do monkeys count as humanoid? Do human count as monkey-oid? I don’t know. Anyway.) main character got me hooked. Then I started it, and decided it would be a good read. Probably because in this alternative timeline, the United Kingdom encompasses France, ireland, and Noraway. What did we get to get Norway? Norway is cool.Britain is cool. 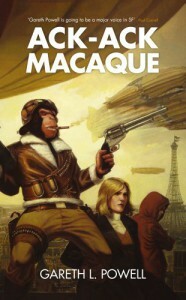 The global pollitics state of Ack-Ack Macaque is generally cool.The first chapter includes Paul’s very very brutal murder. His brain was cut out. as well as this being a gruesome thing to happen to someone, it also reasises a lot of quesitons, to get Victoria investigating, and us reading. I like the idea of Soul catchers, but I also don’t, if you get my drift. The idea of the technology that can record every facet of your memories and your personality is interesting, but the idea of actually doing that is a bit disturbing. Without the soul catcher, we wouldn’t have Paul, or at least a version of him. With the limited view we get of him (he spends most of Ack-Ack Macaque as a program in Victoria’s head), I felt I just want to hug you.We have a cast of excellent main characters. VIctoria is amazingly resiliant, considering what she goes through. She’s a fighter, and takes care of herself, even when she’s really really beaten and cut up, and she is a really good heroine. Merovech and Julie. Shipping so hard! They are adorable and work well together, and hugs to them. And then there’s Ack-Ack Macaque. He is now one of my favourite characters. His cynical outlook and generaly attitude to life is one you won’t forget.The minor characters are good as well. You get the captain of an airship, the Commodore (or variant of that name), who you get attached to in the way that Victoria did. There’s K-8, a clever young girl who works with Ack-Ack Macaque. And there’s a whole lot more antagonists that keep the major plot rolling.It takes a bit of time for everoyne to meet. It’s nice, as it keeps you wondering how everyhting fits together, and at the smae time, it’s annoying, because you’re wondering how it a fits together. The three threads meet fully about halfway trough the book. When they do, you realise how important what they are doing is, not only on a full scale, but also on a personal level-everyone’s got reasons to hate Celeste Technologies.Overall: Strength 5 tea to a book with an excellent setting and cast. Definitely want the sequel.